So, just what are “the Humanities”? We know that, at the University of Alabama, the 23 or so Departments that comprise the College of Arts & Sciences are divided among three divisions: The Humanities and Fine Arts; the Social Sciences, and the Natural Sciences and Mathematics. The Department of Religious Studies, like the Departments of English, Theatre and Dance (the British spelling is not a typo), and the School of Music, are grouped together in the Humanities, to name just a few of the others. 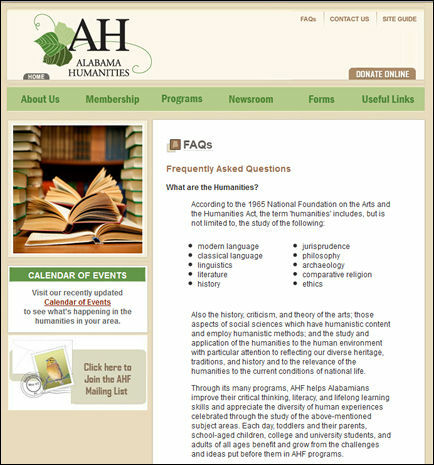 The Department History, which, throughout the history of the European university was commonly placed within the Humanities–such as in the Alabama Humanities Foundation‘s description (below)–is, however, classed on our campus within the Social Sciences, along with such Departments as Psychology, Anthropology, Criminal Justice, and New College, to name but a few Social Science units–though, come to think of it, New College describes itself as an “interdisciplinary liberal arts program,” which complicates things further, for we now need to inquire into the relationship between the liberal arts (sometimes known as the liberalizing arts) and the Humanities. More on that below. There once was a time when it was relatively easy to talk about “the human experience” or “the human condition,” as well as “the human spirit”–all things that scholars as far back as the Renaissance, and further back yet, thought all people shared inasmuch as they were human–sentiments, embodied in the artifacts that we create, that could not just be studied but also expressed, in a variety of ways. Unlike the quantification and explanatory analysis that we see in what we today call the Social Sciences–or so the standard argument goes–there is presumed by some to be a way to study this universally shared human experience that prioritizes finding meaning over causes, and thus relies on interpretation over explanation. (Geisteswissenschaften is what 19th century German scholars called this collection of systematic, scientific [German: wissenschaft] pursuits–those that focus on various sites where we find the manifestation of this human spirit [German: Geist], such that the reduction of the object of study–say, some cultural artifact that strikes us as curious–to merely mechanistic laws is seen as completely inadequate.) While the Social Scientist might wish to explain why someone is religious, the Humanist, as it was classically understood, wants to understand what it means to be religious. And for some, explicating and thereby reproducing that meaning is an inherently worthwhile pursuit. Thus we arrive at a common defense of the Humanities. But today it is not difficult to find scholars from all across the university who critique the notion of a universally shared “human experience”–seeing claims about “the human condition” instead as but one way that powerful but nonetheless local understandings are generalized and thereby exported outward to other people, sometimes on distant shores. For instance, to the question, “What is the American experience?” such a scholar might inquire as to whether you had in mind the experience of living in a ghetto or the experience of living on a private yacht. Or consider the way that feminists a generation or two ago had to rethink their use of “woman” once it was realized that its use in their scholarship had subtly normalized a very specific sort of woman–white, liberal democratic, upper-middle class, North American/western European. (Want an example of this type of critique? Consider the mid-20th century French scholar, Roland Barthes, and his little essay, “The Great Family of Man” [PDF], from his book, Mythologies.) In light of this critique–one that focuses on material difference over immaterial similarities–what sense does it make to talk about a universal, trans-historical sentiment that is somehow accessible by means of a coherently arranged set of intellectual pursuits called “the Humanities”? To rephrase: just what does the academic study of religion have to do with musical performances or theatre? Which brings us all the way back to the liberalizing arts, or a liberal arts education–which is a modern way of talking about what was once considered a classical education in antiquity or even medieval Europe. A liberal education was one that was thought to that prepare a person (well, keeping in mind the dangers of generalizing, let’s be specific: that prepare free, land-owning men) to take on a responsible role as a citizen of the state, involving the study of rhetoric, grammar, and logic (you can see here the key role played by learning how to persuade others of your opinion in a public forum). To be liberal was therefore to be free (Latin: liberum)–free, in a somewhat ironic manner, to contribute to the larger social group as expected of you based on your place within it and your standardized training as a rhetorician. So where does that leave us? Just what is the Humanities and what do it study? What do the academic disciplines organized under this umbrella have in common and contribute? Is “Humanities” merely a convenient placeholder for arbitrary bureaucratic organization? Does it name a shared exploration of transcendent human meaning as it is manifested across a host of cultural artifacts? Are these intellectual pursuits a way for (some? all?) citizens to prepare to contribute to the state? Or, keeping in mind how easy it is to overlook that only free men were once educated in this manner–that is, how a certain sort of self, the self-as-consumer for example, is authorized as if it is the only one–is it what the late-20th century French philosopher Michel Foucault might have called a technology of the self, a way of creating and managing a certain type of self, in specific sorts of of relations with others (or what he called governmentality)? So, just what do you think the Humanities are and what do you think they contribute? This entry was posted in Faculty Blog, Relevance of Humanities and tagged freedom, governmentality, Liberal Arts, Michel Foucault, Roland Barthes, the Humanities, the Social Sciences by Russell McCutcheon. Bookmark the permalink. When we consider, for instance, the natural sciences and mathematics, these things maintain a high-position within what our capitalist society _needs_ to reproduce itself. The social world we inhabit is filled with gadgets, devices, and so forth that need to be constantly “re-invented” so as to have a constant flow of new commodities flooding the market and constant innovation within the means of production in order to create such things as are “new and improved” automobiles and appliances. That Mathematics and the Natural Sciences contribute to these endeavors in a more direct fashion than does the Humanities or the Social Sciences seems a fairly obvious conclusion. So by comparing Humanities to the Natural Sciences and Mathematics, humanities doesn’t seem to have an obvious material or direct application to the production of commodities and the reproduction of material capitalistic relations. However, the Social Sciences provide a bit more of a challenge for outlining the distinction between their identity and that of the Humanities. First of all, although centuries worth of development can’t be neglected in what would come to make up the construction of this idea of a “social science,” one cannot overlook that these fields of study are by-and-large the product of the nineteenth century. Leaps within the natural sciences and the enlightenment’s call to “reason” impels some to start studying, what at an earlier time might have been analyzed through biblical exegesis or under the auspices of the church, through analyses of more quantitative and material-oriented data. This would seem to offer some understanding of why history moved. These new methods challenged the field of history to become more grounded within the world of material evidence. Positivism… positivism… and a little more positivism… Anyways, there’s not much quantitative material data to be gathered within English literature, dance, or music right? At least not for the musician, artist, or dancer I would think. However, this brings up what I think is an even more interesting question: Why is religious studies/the history of religions/the _scientific_ study of religion placed within the humanities? It came from the nineteenth century, right? More emphasis was placed by its earliest proponents upon material data and “scientific” methods, correct? How’d we end up here? I’d submit the hypothesis that we ended up here because of a gap left within the “humanities” due to our more recent secular standards of public education. There’s some related discipline which used to be here hanging out in the good old humanities gang. What was her name? Oh… it was _theology_! Yes, I think the administrators of the academy still think we’re doing something like theology, and peering over a few more recent copies of the JAAR, it’s not surprising how someone could come to such a misconception. Why the humanities for our field–see Chpt 8 and see what you think–we should have been a social science if you go by what the 19th founders of the field had in mind….